Now that we have an official opening date for Star Wars Land, it’s best to keep checking back in on expansion’s progress. We can’t let them fall behind schedule, you know? We’ve been promised the Millennium Falcon will land sometime in 2019, and Disney better stick to that (mostly because we’re saving up all our money for a 1-day admission into the theme park, and please don’t disappoint us, Disney). Last we checked in the construction happening at Hollywood Studios down at Disney World in Orlando, Florida, the area for Star Wars land was just a lot of piles of dirt and trucks. Well, guess what! It’s still a lot of dirt and trucks, but at least it’s clear that progress is being made — though it’s a very slow process. Hey, Coruscant wasn’t built in a day, you know. Our friends over at Nearmap have released a newly updated aerial view of the park, with images taken in late January. While it doesn’t look like much at first glance, there’s actually a LOT is happening in this area. Every single tree in the space has been removed, and replaced with dirt. But, look a little bit closer and a few buildings are actually starting to go up. Buildings! Future Star Wars Land buildings!! 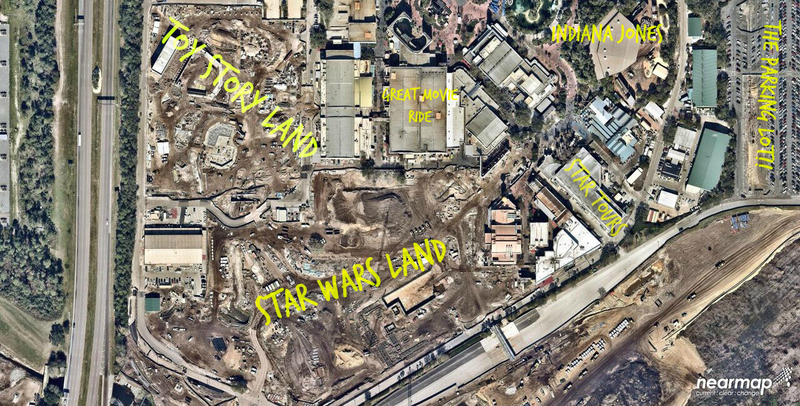 Since we don’t know the layout of Star Wars Land yet, it’s hard to tell exactly what these buildings will be. More than likely, nothing too fancy since these first buildings aren’t THAT big — so think like bathrooms or shops. Buildings for attractions are MUCH bigger, and Disney’s probably saving those for last (so we can’t spy on them from the sky). Another image from this aerial photoshoot shows us the whole Backlands area of Hollywood Studios (this area is called the Backlands, just go with it). While we can catch a glimpse of Star Wars Land, we also get to see the construction happening next to it, too: Toy Story Land!! There’s no opening date yet for Toy Story Land, but let’s hope Andy’s toy box opens up a tad bit sooner than Star Wars Land. 2019 is still so faaaaaaaaaaaaaar away.